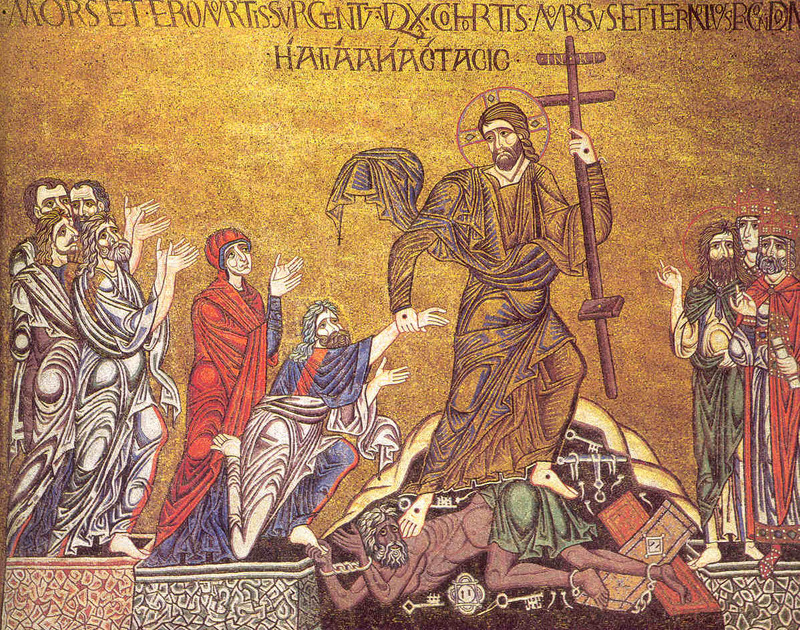 The Resurrection of Christ, the premier event in the mystery of the divine economy, gives us each year the opportunity to delve into this event and little by little to engage the mystery of the Resurrection with our own resurrection. Besides, this is the purpose for the establishment of the annual festive cycle of Pascha. In the joy of the Resurrection of Christ we should be reminded that Christ in Holy Scripture and devotional texts is characterized as "firstborn". Besides, in one of the Resurrectional hymns we chant: "He became the firstborn of the dead" (πρωτότοκος των νεκρών εγένετο). The word "firstborn" (πρωτότοκος) refers to the first child of a family. This name is assigned to Christ in many ways. The Apostle Paul writes that the Son and Word of God is "the firstborn of all creation" (Col. 1:15), "the firstborn of many brethren" (Rom. 5:29) and "the firstborn from the dead" (Col. 1:18). Saint John of Damascus, analyzing these Scriptural phrases, says that the Son and Word of God is called "the firstborn of all creation" as the Only-begotten who was born from God the Father before all ages, though creation was created in time. This is why Christ is called firstborn and not first-created. He is also characterized as "firstborn of many brethren" because in His Incarnation He received flesh similar to ours, when He was born the firstborn from His mother, and we are brethren except that He is by nature the Son of God, while we are sons of God by Grace. This is why He told His disciples: "I ascend unto My Father and your Father" (Jn. 20:17). Within this perspective, Christ is the firstborn from the dead, because He raised Himself up first as God, and then gave this gift to us. The Apostle Paul confesses: "And He is the Head of the Body, the Church: who is the beginning, the firstborn from the dead; that in all things He might have the preeminence" (Col. 1:18). Christ is the Head of the Church and has preeminence above everyone. As Christ is the firstborn of all creation, because He was born before all ages, so also He is firstborn from the dead before others. And before Him some rose from the dead by His power, but they died again. But He, with the power of His Divinity, raised His Body and remains throughout the ages alive. He was the first who emerged from Hades and arose. Saint John Chrysostom writes that He who is above all others in heaven merged Himself with those upon the earth, and in this way "He is always first; the first above, the first in the Church... first in the resurrection." From this teaching we derive many spiritual meanings that would be good for us to recognize. The first is that Christ is the first in the Church. The Risen Christ is Head of the Church and no one else. The Bishops are Heads of the Church in type and place and cannot exceed Christ. Nobody can exceed Christ who is the Head of the Church. Everyone must obey His commands and Christ acts through the Church, which is His Body. Christ and the Church are closely linked. The second is that the Resurrection of Christ heralds our own resurrection at the appointed time, when Christ will come to judge the living and the dead. In as much as our big brother arose, this means he will raise us also. The image of the swimmer is very characteristic. First the swimmer's head emerges from the water, then his body comes out. Thus, Christ first arose, and then will follow the members of His Body, all His brethren, who even now partake of this life. For all those who live as members of the Body of Christ can live the resurrection, even if they are found to be in the salty sea of this life, since their head, Christ, is found outside of this sea and in this way they breath spiritual oxygen. This is why the sacred Chrysostom writes in his Catechetical Homily: "For Christ, being risen from the dead, is become the first fruits of those who have fallen asleep." Thus, Christ is the firstborn of the dead, that is, the beginning of the departed. The third spiritual meaning is that the phrase "firstborn from the dead", which is associated with the phrase "God raised him up, loosing the pangs of death" (Acts 2:24), states that the resurrection of the dead is a birth (τόκος). According to Saint Nikodemos the Hagiorite, man is given three births: birth according to the flesh from his parents, spiritual birth from Holy Baptism, and eschatological birth from his resurrection which will happen at the Second Coming of Christ. Christ also is called firstborn according to these three births: after His birth from the Virgin He was presented in the Temple, after Baptism He presented to God His perfect love by His victory over the temptations of the devil, and by His resurrection He ascended into heaven and was presented to God the Father as the beginning of those to be resurrected and ascended. This is why the day of the death of the saints is called a birthday, and this is how it is celebrated; they are born in the Kingdom of God. The Risen Christ we celebrate these days is the firstborn from the dead, our firstborn and greatest brother who arose, triumphing over death, sin and the devil. And we His brethren, by His power can be raised and conquer death, the sin and the devil. This is our greatest solace, our only hope. By the birth from our parents we are humans. With our Baptism we became Christians. With our resurrection, first the spiritual one from sin and then the bodily one at the appointed time, we will live eternally with Christ who is risen from the dead. Our goal is to live forever as brethren in Christ, when He, our first brother, will help us participate in His victory, and gain hope, light and life. Source: Paremvasi, "Πρωτότοκος των νεκρών εγένετο", April 2008. Translated by John Sanidopoulos.